Information about the Greater Albuquerque Recreational Trails Committee. View meetings agendas and minutes. The Greater Albuquerque Recreational Trails Committee (GARTC) supports, encourages, and advises local, state, and federal agencies to set priorities to optimize the use of appropriated funding for the purpose of developing new, while maintaining and renovating older, trail networks throughout the greater Albuquerque Metropolitan region. The committee reviews plans and projects that will impact trails, providing comments from the users' point of view; encourages governmental entities to acquire and utilize right-of-way; and helps to update and fulfill the objectives of the Trails and Bikeways Facility Plan. GARTC consists of eight citizen members, including representatives from the following user groups: equestrians, physically challenged, pedestrians & hikers, off road mountain bicyclists, active elderly, and runners & joggers. The committee also includes two at-large members representing the east and west sides of the Rio Grande. GARTC meets the third Tuesday of every month from 3:30 to 5:30 p.m. Meetings are open to the general public. The City of Albuquerque has more than 400 miles of bike paths and trails. Interactive and printable maps can be found on the Bicycling page. Note that listed trails are for the enjoyment of all non-motorized users. Albuquerque Open space, a Division of the Parks and Recreation Department, maintains a range of helpful maps for both paved and soft surface trails throughout the Albuquerque area. The Sandia Mountain Trail network, located within the Cibola National Forest and Sandia Mountain Wilderness areas on the east side of Albuquerque, offers soft surface trails along the foothills and up to Sandia Crest. 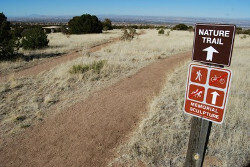 The Manzanita Mountains trail system is located east of Albuquerque and south of the town of Tijeras. It includes a vast network of soft surface trails. Petroglyph National Monument is located on the west side of Albuquerque and offers a number of recreational trails that wind along a series of extinct volcanoes. The Valle de Oro National Wildlife Refuge is located seven miles from downtown Albuquerque. At 570 acres, it is the southwest's first urban wildlife refuge.